This post is sponsored by Chesapeake Bay Candle with SheSaavy. As always, all opinions are my own. I may be in the minority, but I absolutely love winter weather. To me, winter is the perfect time to slow down and find joy in the little things with loved ones. 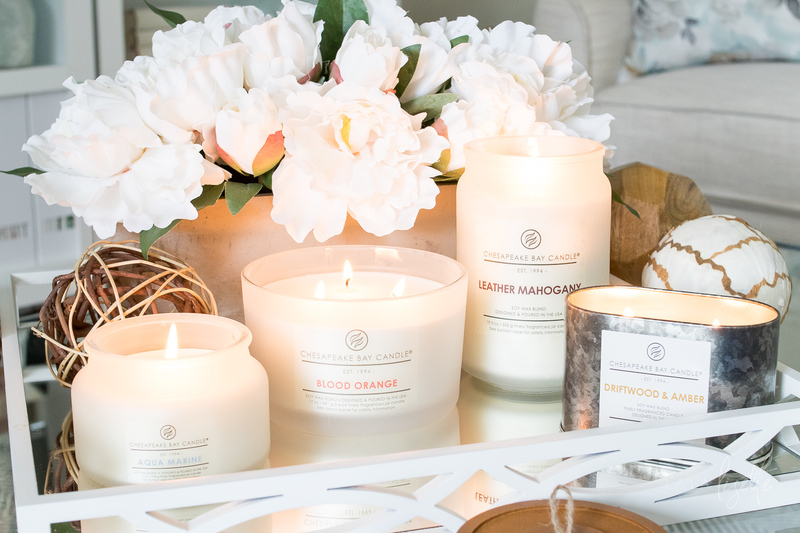 Candlelight provides the perfect backdrop to relax and enjoy down time, and The Heritage Collection from Chesapeake Bay Candle are the perfect candles for the practice of finding joy known as hygge. Hygge, pronounced “HOO-gah,” is way of life that celebrates coziness, shared meals, and time with loved ones. Emphasizing warmth, kinship, and an appreciation for the little things, hygge is a perspective on life that started in Denmark. Hygge is a trend in the stateside, especially during the cold winter months, as more Americans look for a way to find happiness since the shorter days tend to cause seasonal depression. You probably already practice hygge without realizing it. Sitting by the fire and sipping a warm drink with the company of family and friends? That’s hygge. Cuddling up on the couch with your darling pups and blankets? You guessed it! Hygge! But the most common way of practicing hygge is with candles. Candlelight is warm by nature, and it provides the perfect backdrop to relax. I like to place dusk to dawn electric candles at my windows as soon as our days get shorter. It makes our home warm and inviting both inside and out. I love having candles all over the house in the winter, and Chesapeake Bay Candle make some of my most favorite candles ever. The first time I purchased a Chesapeake Bay Candle was here in Jacksonville shortly after buying our new home. I feel silly for admitting the reason for my purchase, but among the many candles on the shelf, the Chesapeake Bay Candle ones were honestly the prettiest. I liked the frosted glass because it made the candle seem like a posh and luxurious purchase for our home. The name of the company itself evokes warm and fuzzy feelings my former home state of Maryland, and memories of summers feasting on Chesapeake Bay crabs makes my heart happy. Chesapeake Bay Candle has a special line of candles called The Heritage Collection. These candles have a modern and clean design as seen in their typography, labels and lids. The candle packaging was designed to resemble a floating bottle on the ocean, with the frosted clear glass evoking the coastal marine air. Some varieties come in a galvanized tin as a nod to the industrial chic décor trend. The Heritage Collection embraces the natural, rustic charm of the Bay and provides an array of soothing, energizing, and refreshing scents. The collection celebrates Maryland’s idyllic shoreline with authentic fragrances inspired by local botanicals and fruit. Each creation is built around a solo or duo ingredient accord and embellished with many layers to add complexity and depth. All fragrances are beautifully balanced and rounded with natural essential oils. See some of the candles in the Heritage Collection below. This scent is my favorite of the four. I love anything to do with the serenity of the ocean, and this candle makes me feel like I’m sitting on the beach. It boasts fresh notes of bergamot, lemon zest, marine accord, and pineapple. 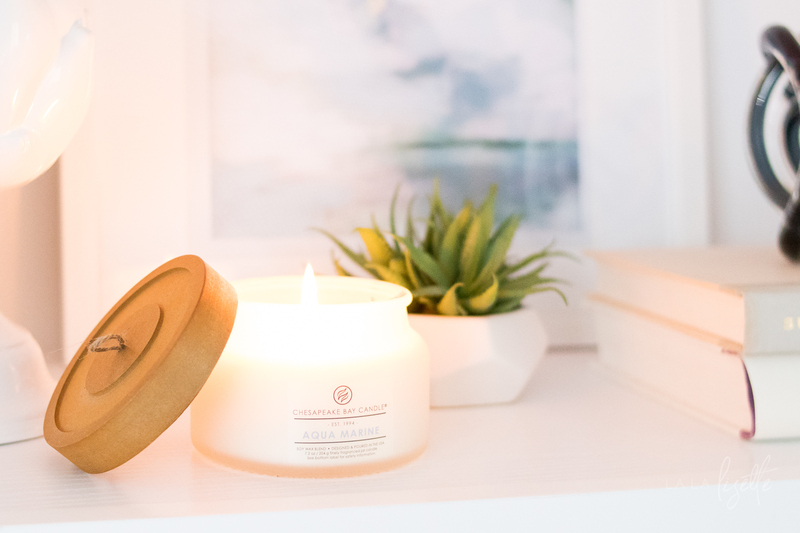 The notes of lily, lotus, and seagrass add to the allure of the sand and surf, and our favorite scents of musk and sandalwood make it perfect for any room. This soy blend candle was designed and poured in the USA. $15. There’s something about the energizing quality of citrus scents that makes them a necessary component to your office. 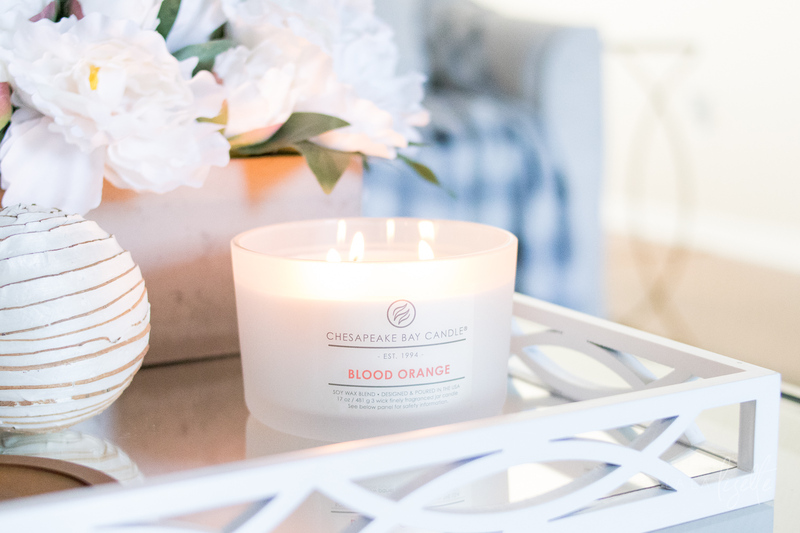 This blood orange and mandarin scented candle also has notes of passion flower, melon, and mango, followed by a touch of cedar wood, honey, and a twist of pepper. $25. Sun soaked driftwood and coconut water wash over the white hot sands of the bay. Silky gardenia and cashmere-infused vanilla sink into a musky base of sandalwood and amber. Experience the authentic and peaceful scene of the Chesapeake Bay. This soy blend candle was designed in the USA and poured in Vietnam. $15. Perfect for the candle-loving man in your life, this candle’s scent reminds me of a loved, worn-in leather armchair by the fire. Top notes of zesty citrus and raspberry balance the spicy floral heart of jasmine, lily and clove. Aromatic thyme and juniper are complemented by the rich notes of black amber, luxurious leather and sandalwood, providing an intoxicating warmth and elegant complexity. $25. The Heritage Collection from Chesapeake Bay Candle contains many more elegant scents that will surely become staples in your home. Hygge also encourages you to bring the outdoors in and what better way to do that than with candles that bring the comforting scents of the Chesapeake Bay? Which candle will you bring home? How are you finding warmth and joy this winter? I honestly never knew how to pronounce this! Hoo-gah! Who knew?! These candle scents look lovely and as always, your photography is gorgeous. I’m obsessed with the tin candle! Maybe I need to get out of my bubble more but I’ve never seen anything like that!! Also I need to practice the HYGGE a lot more! Imma buy some of these candles and do that!